Where do we start with this one? Well. It’s not a cover of the Edwin Starr disco classic. It’s project, featuring music and video, dealing with the alienation in modern technocratic society and trying to encourage us to reconnect with nature and each other by stepping away from the machines. Sokol (Czech for falcon, apparently) crowd-funded “Contact” by going out on the streets with a t-shirt and a piggy bank to advertise the project. The song is built on a thudding bass line, shimmering indie guitar sounds and some of the dirtiest synth gurgles you’re likely to hear. It builds to a peak, breaks down before building again to a climax with some heavenly harmonies. It’s a very listenable piece of guitar pop/indie. But you really need to watch the video. It was shot in Mongolia and has the production values of a BBC nature documentary. It’s a stunning piece of filming, showing the sheer joy of a father and son on horseback hunting with eagles. 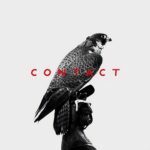 It meshes perfectly with the song’s message of disconnecting to reconnect, creating a hauntingly spiritual audio-visual experience.